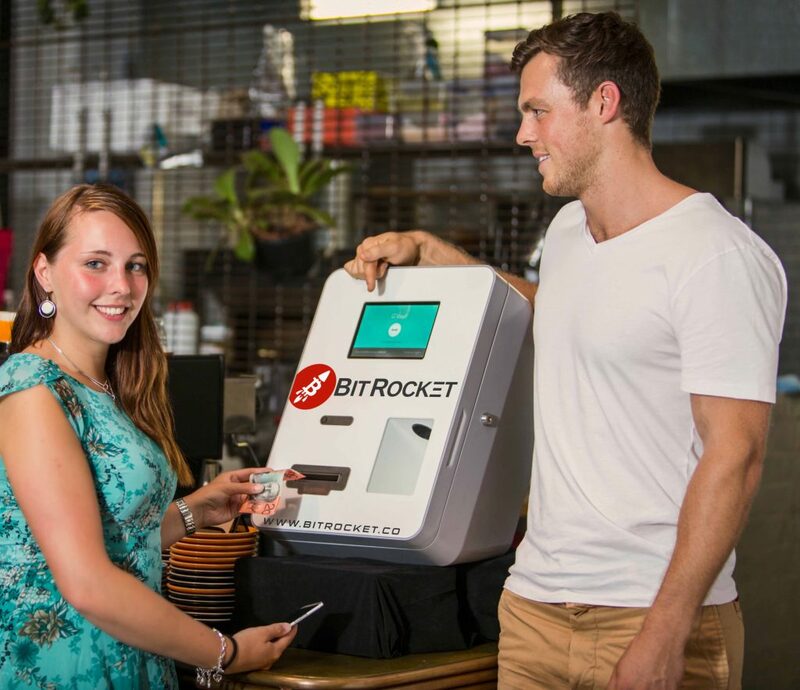 way to buy and sell Bitcoins with cash in Australia. Want to buy or sell Bitcoin and sick of the hassles and hurdles? Want to get your hands on Ethereum, Dash, ZCash, Litecoin, or an ICO and don’t have time to open 5 accounts on different sites? Just visit one of our vending machines (ATMs) and transact instantly with cash. You only need your wallet app, which can be setup in 2 minutes on your smartphone. Just show our machine the QR code and insert cash. From your wallet app, you can convert freely between digital currencies, ICOs and enjoy the flexibility, liquidity and power of blockchain technology. Say goodbye to the hassles of online exchanges and risky face-to-face trades. 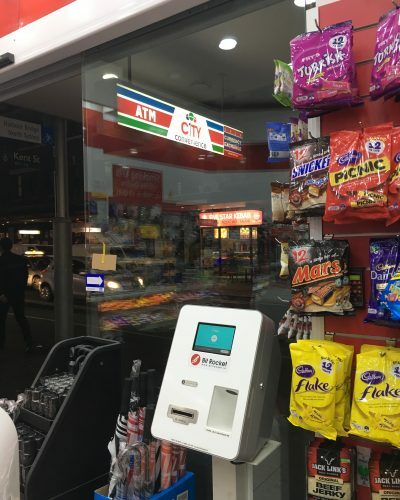 No more leaving money on exchanges that might disappear overnight, no meeting up with shady strangers for trades, do everything with the comfort and security of a vending machine. Buying with cash is simple. Just install a free bitcoin wallet app such as BreadApp.com. You only need the QR code and the cash you want to convert into bitcoin! For cash out, just your wallet app is needed, you'll scan our QR code and press send, out comes cash. If you just want cash fast, we're here to help. LOAD UP at our machines and then convert between crypto-currencies with your own timing with simple wallets such as Exodus.io or your favourite exchange. Once you have bitcoin, conversion is simple and fast - so you can adapt, trade, and HODL to your heart's content. Once transacted, you are in full control of your money. Just keep copies of your wallet 12 word backup phrase, and you can restore on any phone or computer at any time in the future. 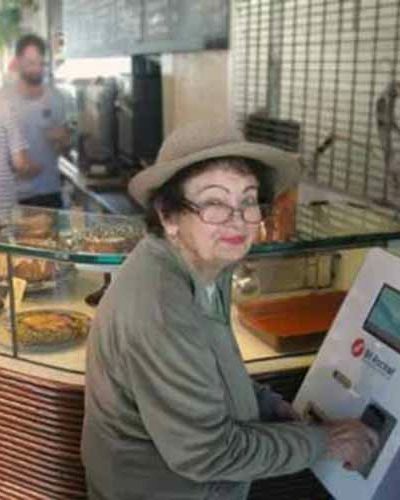 Why keep your $$, ɃTC or precious copies of your ID with strangers? Why arrange risky and fiddly meet-ups? Don't risk bank transfers taking days, or leaving money on exchanges in the hands of others. Stay in control. Available in Sydney, Melbourne, Tasmania. Coming In 2018: Parramatta, Gold Coast, Brisbane, Hobart, Perth, Newcastle and Adelaide. Bring a valid ID with you can just send us your details here. Contact Us for any questions, we're here to help! Open your Bitcoin wallet app. If you don’t have one yet, try BreadApp.com – it takes 2 minutes. Press “RECEIVE” or “Request” on your wallet app. 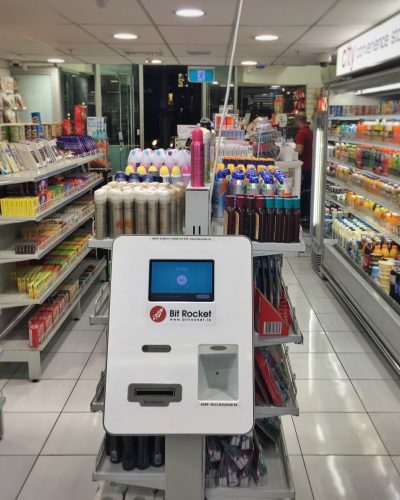 You are about to receive bitcoin from the BitRocket ATM! You should see your QR code (block of dots). Turn the phone brightness up and place the screen against the QR scanner panel. 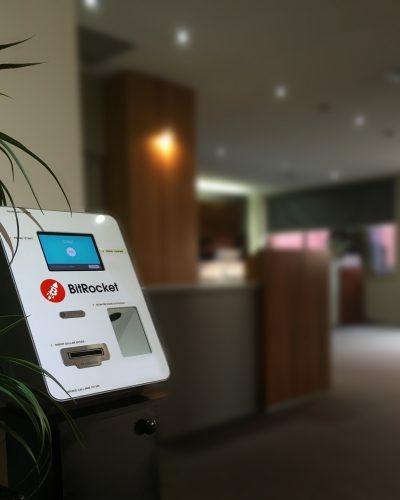 Choose “Cash out” or “Withdraw” on the BitRocket ATM screen. Enter the amount of cash $ desired, press “Cash out” to confirm. 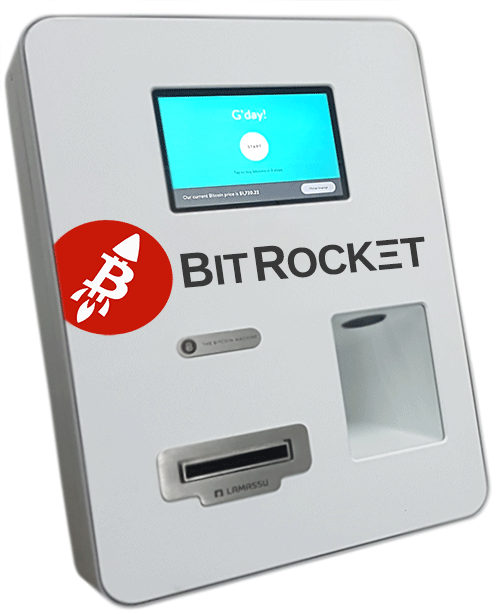 The BitRocket ATM shows you the amount in ɃTC. Check the amount in BTC is less than the total you have in your wallet to spend including bitcoin network fee. Compare the BTC amount, not the $ estimate your wallet shows. BitRocket ATM screen shows running total for each note. Insert more notes (as desired, to maximum of $10k). Then press SEND when done. Check your wallet app, it should be instant! Amounts under $200 may take up to 10 minutes and it is 100% normal for transactions to start as ‘pending’ or ‘unconfirmed’ at first. Scan the QR code on the ATM screen with your mobile wallet. After scanning, Do not alter the amount in ɃTC (or ƀits) – check it matches the amount on the screen. Sending from broker services or exchanges may cause delays. We believe in simplicity and a great experience. 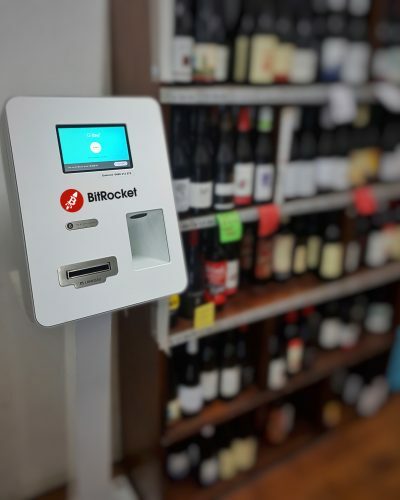 BITROCKET can help you at every step of your journey into the world of crypto-currency and blockchain digital assets. There’s no need to compromise. Should you need guidance, we have help material, excellent tutorials and of course personalised service. BitRocket takes the stress out of transacting – no waiting for weeks or months on exchange tickets. Our systems meticulously record each scan of a QR code, each note and of course its flow into and out of the blockchain ledger. If you run into problems, we can trace them for you and resolve it with just a few details. For higher value transactions (>$100k), we can also offer concierge and escrow services, as well as bespoke brokerage. Here are just some of the most common questions and answers. For a more comprehensive list, see our guides or contact us. What do I need before I go? 1) Bring any valid ID with you or just send us your details HERE. It’s a one time check and you won’t have to do it on your next visit. Other great apps include Airbitz, Mycelium, Jaxx, Exodus, Copay and Bitpay. To avoid delays and difficulties, we don’t recommend Blockchain.info Wallet, Coinbase, Xapo, Coinjar or TenX, or any exchange. These can take a long time to process incoming and outgoing transactions, causing frustrations. Also a real wallet will leave you in control of your funds, think of it as keeping gold in your safe, not someone else’s safe. 3) The cash you want to exchange into bitcoins. We don’t accept cards due to the risk of stolen cards. How much can I buy or sell in a transaction? The minimum BUY transaction is just $5! The minimum SELL transaction is $50. The maximum BUY or SELL is $10,000 AUD. This is for buying or selling Bitcoin. 1. Press “Start” on the machine. 3. Hold the screen of your phone against the glass panel. 4. Enter as much cash as you wish to deposit. 5. Press “SEND”. That’s it. I want to buy over $10,000 worth of Bitcoin, can you help? Sure, if you are doing this over several transactions you will be fine. For larger amounts (over $100k), our concierge service may be able to help, via our CONTACT page. The minimum BUY transaction is just $5. The minimum SELL transaction (withdraw to cash out) is $50. The maximum BUY or SELL is $10,000 AUD per transaction to comply with local laws. Note that you may wish to visit multiple times if you wish to do more. 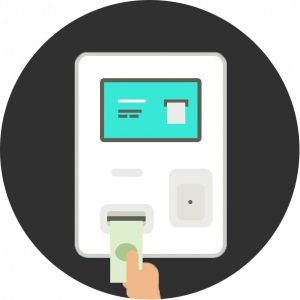 I want to have a Bitcoin ATM, can I? We’re looking for new partners to join our operator network, learn more. You might not even need to buy an ATM. Most of the cost and effort is running the service, customer queries, handling transactions, compliance, marketing, and financial trading. 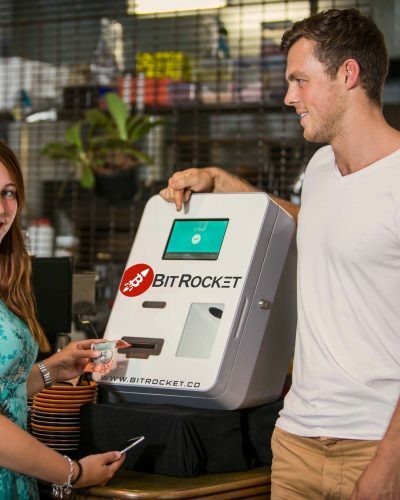 BitRocket partners enjoy these benefits while achieving financial rewards. There are no extra fees to pay. The price on the machine is the all-inclusive price you pay. We make money on the spread between buy and sell prices. Many online services don’t show you the hidden USD -> AUD costs or service fees and can be more expensive for a slower and more risky service. What is the price right now? The rates are based off Australian prices such as BTCMarkets.net and IndependentReserve.com – with roughly 5.5% on top for convenience. It changes every minute, with the market. Look at the screen when you visit for the exact number. The rate on the screen includes any and all fees, nothing hidden. Contact us. Whatever your question is, we aim to respond within 3 business days. Often your query may be answered faster, but please provide as much detail as possible to help us address your query. Note: If you have contacted us previously, please provide details so we can combine the information and help you faster. Preferably mobile - so we can contact you via call or SMS, helps us match your question if you contact us online and on the phone. For urgent queries we may contact you here as well as email. Any transaction receipts, screenshots of your transaction list, advanced details (e.g. 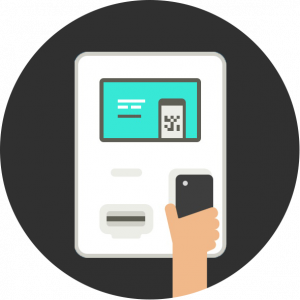 wallet to/from or transaction pics), photo of the ATM screen or anything else relevant! No	 Maybe	 Yes	 Please answer to proceed with your submission. 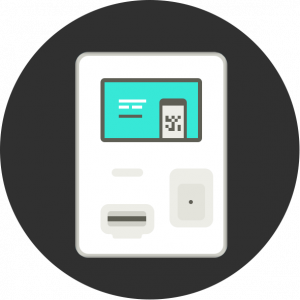 If you’re asking about a particular BitRocket ATM, please provide the City or Suburb name here. Otherwise your nearest City or Suburb or postcode is optional. If you're enquiring about a transaction, please enter the Invoice ID that is on the receipt. For multiple transactions - separate Invoice ID's with a comma. If you're enquiring about a transaction, please select the date of your transaction. If you are asking about a transaction, help us by providing the address you scanned (if you know it). Even the last few letters. Copyright © 2014- 2019 BitRocket | All rights reserved. IMPORTANT: This information has been prepared for distribution over the internet and without taking into account the investment objectives, financial situation and particular needs of any particular person. Offline until serviced and tested. Buying and selling on the white machine is enabled. Orange machine allows BTC and LTC, but no dispensing currently. Being replaced, will be out of action for weeks. We are experiencing UNUSUALLY HIGH DEMAND. Due to the recent price spikes and resulting bitcoin network congestion your queries may take up to several business days to be handled. We keep thorough transaction records so please CONTACT US [via the form] and mention any previous messages or conversations you might have had.